At the turn of the millennium, Carolyn Blanchard decided to journey west after seeing ads in gardening magazines proclaiming that Crested Butte was the Wildflower Capital of Colorado. She was an avid gardener, relishing all the magazines she subscribed to that depicted vibrant flowers and perfect gardens along with every flower festival across the country. David liked to hike and Carolyn wanted to see the wildflowers, so it seemed like a happy match for a vacation. She had never been to Colorado and as they topped the hill overlooking town, Carolyn thought she had never seen such beauty. They walked around town for a while and when somebody held the door open for her at the post office, a rarity in the city she was living in, she claims she almost fainted. She felt it was the most wonderful place in the world. During the week they spent up at the Cement Creek Cabins, the two rethought their lives and priorities and returned home with a five-year plan—to move to Crested Butte—which they held to and manifested, moving here in 2005. This end-of-the-road town is a far cry from the reality of Detroit, Toledo, northern Kentucky, and Cincinnati, the cities where Carolyn spent her formative years and her college days. She liked to cook and her mother thought she should have an income-earning profession. Carolyn graduated from Edgecliff with a bachelor of science in nutrition in 1974 and became a registered dietician, then getting her master’s degree at Tufts University in Medford, Mass. while interning her clinical work at New England Medical Center in downtown Boston. But she laughs that she never felt like she ever quite fit in with the New England attitude. Carolyn’s interest in the profession was in national nutritional planning and policy, and she felt the need to expand her scope of experience and understanding. Carolyn reasoned if she wanted to work in national policy, she needed an understanding of law. She enrolled in law school at the University of Detroit, attending classes at night and working through the Visiting Nurse Association, teaching diets in home care during the day. She graduated with a JD in 1980. However, the realization hit her that to actually be successfully employed in this field she’d have to live in either Washington, D.C. or Chicago. “I didn’t want to live in either of those places so I stayed in Detroit and practiced criminal defense law for 20 years,” she says of the private practice she started in 1984. Carolyn met her husband, David, in 1992 at a political event while she was campaigning for a judgeship in Wayne County (Detroit). He was a staffer for a congressman as well as the greeting party at the event. They married in 1998. David moved from politics into the business end of health care while Carolyn continued her law practice. But when they finally moved to Crested Butte, though Carolyn had reciprocity with her attorney’s license, she was required to take the ethics test in Colorado because it wasn’t extant when she first took the bar. “It was after Nixon,” she laughs. She was assigned criminal work, which means she would be assigned as a lawyer to people too poor to afford one. It’s called Alternate Defense Council in Colorado. “I asked to be on their list for appellate work, which is when somebody gets convicted and wants to appeal. It’s a statewide list and I could do it from my home in Crested Butte because I only had to be in court once per case and visit the defendant once where they were locked up,” she explains. She retired last year, after a decade of practicing law in Colorado. Having been raised a Catholic girl and in parochial schools throughout her life, Carolyn, of course, became involved with Queen of All Saints Church. Last year, she became the director for the charity thrift shop, Saint Mary’s Garage, which was started in the fall of 2009. 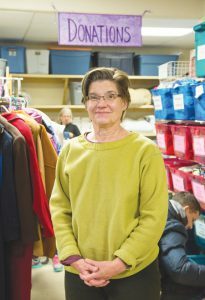 “Some of the men who go to our church saw men who were looking for work, standing in front of the hardware store,” she tells of the charity’s beginnings. “The men had no coats and it was decided something should be done about it. It was autumn and getting chilly.” The idea to collect clothes to give to those in need was agreed upon. And everything in Saint Mary’s Garage is free. Absolutely free. 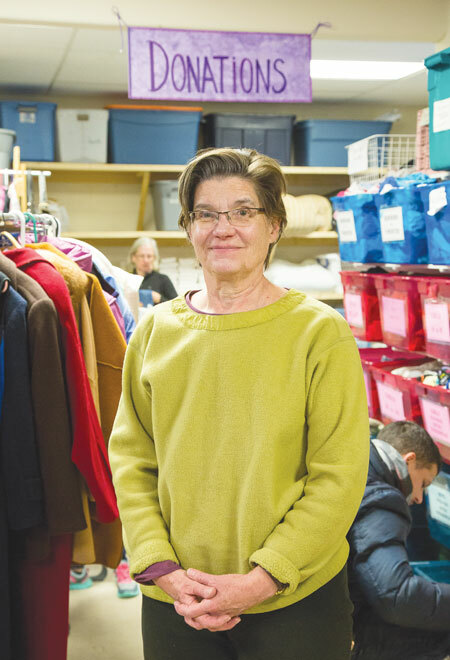 The garage is staffed by about 30 volunteers; not all are affiliated with the church, as many townspeople step up as they have time in their busy schedule, or retirees lend a hand. Carolyn became involved when the church asked for volunteers. Dianna Graves, who initially organized St. Mary’s Garage, was the director from its inception until Carolyn took over in December 2015. “So I retired from law and went into scheduling volunteers, collecting the money and taking out the trash,” she laughs, “Those are my big jobs. Some want the store to expand—we’d like to find a permanent home. People have a lot of things to give away. It’s a very generous community. The commitment of the people of the church is to maintain this service for the community. We’ve had about 500 people bring in donations this year and we had 1,200 people come in to help themselves and their families. Everyone is welcome. St. Mary’s Garage is located at 300 Belleview, Unit 2, across from the skate park and next to the sledding hill. It’s open 4 to 5:30 p.m., Tuesday and Thursday, and Saturday from 10:30 a.m. to 5 p.m. Donation drop-off times are the same as open times. For more information visit their website stmarysgarage.org and on Facebook under the same name. You can call Carolyn Blanchard, director, at (970) 318-2826.